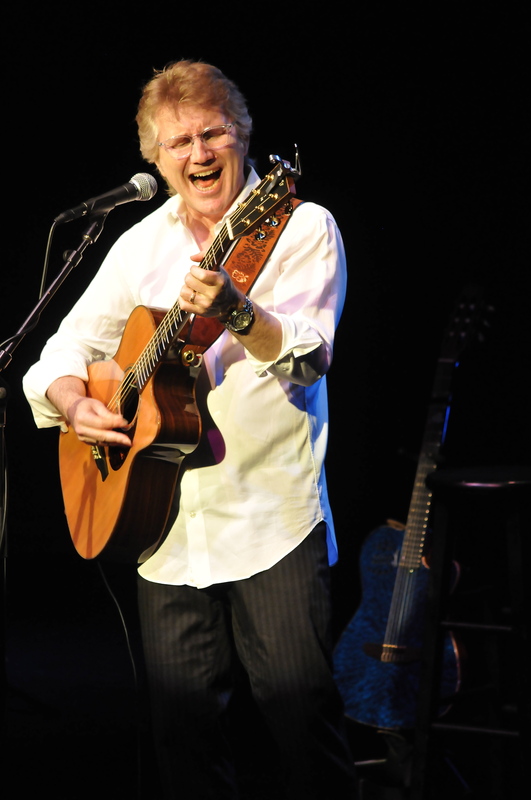 Guitarist, vocalist Rik Emmett, one of the founding members of the band Triumph, played a rare acoustic show in Western NY Friday evening. The show took place in the elegant Bears Den inside Seneca Niagara Casino. For those of you who have never seen a show there, you don’t know what you are missing. There is not a bad seat in the venue and on top of that it is the best sounding room in the entire area. Rik was accompanied by guitarist Dave Dunlop and bassist, keyboardist Steve Skingley. The show kicked off with “Never Surrender” a song rarely played in the acoustic format as the spectacled Emmett astutely noted to the crowd. He also mentioned how he had just gotten new glasses and how resembles David Letterman a little. One fan yelled out “but you are better looking” as Rik quietly stated to the audience “just a little bit” facetiously. With commentary like that you knew this show would be like no other as Rik and Dunlop traded barbs and comedy lines throughout the evening. Yes, I almost forgot, there was also music as well. Perhaps the best sounding song early on was the Triumph classic “Lay It On The Line” which set the tone for the rest of the show. The intimate venue made for a very close up and personal show as Rik explained the way he built the show it gave them some latitude as being able to play some rare things for everyone. As he introduced “Out Of The Blue” from his Ipso Facto solo disc, he told how they recorded the song originally in two takes for the album. As the show grew to a close fans started to yell out songs and Rik jokingly said this isn’t request hour. He did throw a curveball when he stated what song did Triumph always end the show with? The crowd mostly expecting “Hold On” (surprisingly absent for the night), were dealt an obscure gem in “Suitcase Blues” to end the show. The diehard fans of Rik sure went home extremely happy with the rarely played “Ordinary Man”, Don Henley cover of “Boys Of Summer” and a few solo songs seldomly played. Emmett showed his versatility to adapt with different styles while still maintaining the high skill level of musicianship that he is well known for. An extra special thanks to Tony Astran who let us review this show!